The blue intermodal bogies are still there on the spur by PSEG in Hicksville, though??? I would assume so since these cars were in front of the bogies. 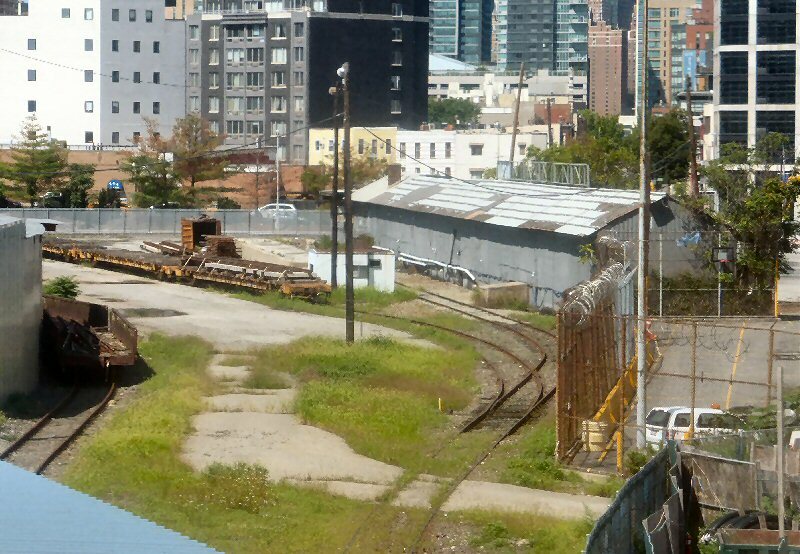 There's about 6 or 7 6000 series gondolas and LI 107 which is from the old rail recovery train (build date of 1945) lined up at hicksville freight. The 6000 series cars were supposed to go to Ohio until some issues over interchange came up. cr9617 wrote: I would assume so since these cars were in front of the bogies. There's about 6 or 7 6000 series gondolas and LI 107 which is from the old rail recovery train (build date of 1945) lined up at hicksville freight. The 6000 series cars were supposed to go to Ohio until some issues over interchange came up. All the bogies are still there. They moved all but one of the gondolas from ye old LILCO track. We can add the Yard A enginehouse to stuff that was scrapped, they began Fri and it was totally gone by today. A bit sad, but progress is progress. That crew worked quickly, it was gone by Friday evening. The yard office is next. Thanks for the photos and wow they're really aggressively cleaning house. Bad Luck wrote: That crew worked quickly, it was gone by Friday evening. Heard the Arch Street freight station may likely go (contaminated with oil and too costly to renovate), once the yard work is all done. It wasn't long for this world at all after the freights stopped, and the cutoff being torn up was just a nail on the coffin. I wonder what's next with it; more gentrification boxes or rail usage. The north end of the Montauk Cutoff is now actually, cut off. Yard A and Arch Street can still be accessed via the Sunnyside loop without the cutoff. The last traces of Yard A are gone with the yard office. There's a bunch of new poles, wonder what they're for? That development they were talking about? Lighting?